Hello! We are R3PP. 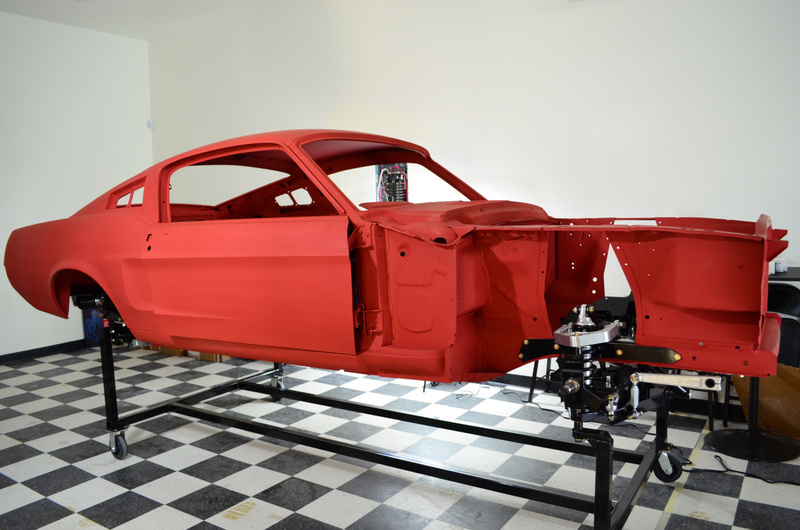 We build brand new, Ford Licensed Mustang body shells and performance suspension that bolts right on to the frame. Our body shells are all built to spec and are hand-assembled in California on our custom jigs. Our suspension has racetrack power with the comfort of a Sunday drive. Check out our website and feel free to ask any questions! Setting a new standard for Muscle Car and Resto-Mod builds around the world. Thank you for participating here at VMF! Could you answer a few questions for us? #1) What connection, if any, did your company originally have with ThoroughbredGT? My understanding is that Bill Schaffhouser was the founder and took over ThoroughbredGT's body production, moved it to Canada, then to California, and finally obtained licensing rights from Ford for your bodies. Is this correct? #2) Is Bill Schaffhouser still associated with R3PP? If not, why? #3) I am very interested in your cantilevered 4-link rear suspension. The price of your current package deal at about $7K is very appealing. Could you please publish specs with relevant diagrams for the following: A) ride height min/max, B) suspension travel range, C) instant center location relative to wheelbase, D) anti-squat adjustments for wheel hop, and so forth. I simply don't know the design goals of your approach. I can't decide if your rear suspension is too mushy, too harsh, too strip-oriented, or even Goldylocks perfect for the average daily driver. #4) Could you please create videos showing your rear suspension in motion? I would like to see both articulation of the rear suspension plus outside POV of the handling characteristics while A) cruising on the road, B) handling bumps, C) during hard launches, D) during hard breaking, E) aggressive slalom runs, and similar activity. Studio photos of a car up on a lift with no wheels really don't tell us anything about suspension behavior using a stock ride height, much less with a 2" drop. These are some great questions. And honestly, some of our most common ones. I'll do my best to answer them thoroughly. 1. We purchased Thoroughbred when they went under. I'm not sure where the Canada rumor came from, but R3 has always been in California. While we do some business with a company in Canada, our home base is here in Southern Cali. 2. Staff changes happen sometimes. Bill had different ideas for the company than the owners did (he is not an owner of the company). 3. We are working with a professional to draw up CAD images of the suspension, and videos of it cycling through. In the next few weeks I'll be publishing all these dimensions. On Monday, we will meet as a team to put together this information and release it online. I'll be sure to post it here. In our opinion, this suspension is the White Whale of a setup. Its racetrack ready, but really focuses on ride comfort. Our designers have a n off-road background (out here in teh California desert, we all have off-road hobbies) so they twanted a suspension that would handle like a track car, but ride like a luxury vehicle. They spent a few years designing this cantilever system. It allows for more wheel travel, and strengthens the torque of the rear end. When you put your foot down, the car will squat instead of fishtail because of the 3 point system. I'll get an official write up from our shop manager on Monday. 4. Along with the CAD, we have GoPro camera installed on our test car. We will have these videos shortly. I'll make sure the video highlights all the things you've listed here. I'm really excited to be here and start a dialog about our product. We know there are a lot of questions still, so feel free to shoot them at me! It's been so long that I can't recall exactly where I got the Canada connection. I vaguely recall that towards the end, the TBGT web site steered people wanting a full car body to a Mustang restoration company in Canada, which turned out to be owned by Bill. Then Bill turned up in a video about the new R3PP company in California. Ol' Sherlock put things together from that. It may have been a coincidence that the guy who owned the shop that TBGT recommended later relocated to Cali and became the R3PP manager. I'm excited about your rear suspension. I suspect your setup will be ideal for my I6 66 convertible. If the vids and specs look good, I'll be buying a full rear setup. Anyone with the crappy 7.25" rear end needs the Whole Magillah ready to bolt it.